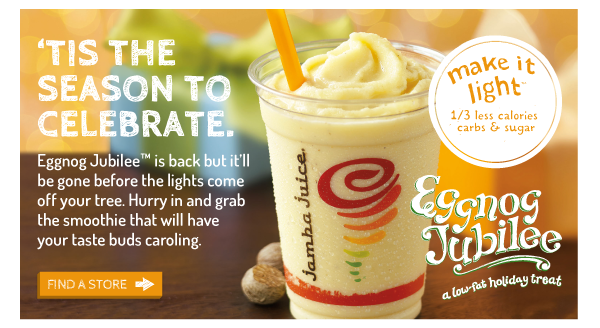 Jamba Juice has a flurry of holiday specials coming up! I would love to take advantage of all of them. They have a great new flavor Eggnog Jubilee. They are also offering 25% off of their catering services, which are awesome and have some great items for your Teacher appreciation, or other Holiday events. A few other fun offers in case you’re interested. As always sign-up for their e-mails to get the latest news on freebies and more! To ensure delivery, add jambajuice@jambajuice.fbmta.com to your address book. Jamba Juice!!! I love it!! Jamba Juice is amazing, blows smoothie king out of the water! I had no idea that Jamba Juice did catering. that’s really nice they do Catering & I think giving 25 percent off is as huge help. I have never tried Jamba Juice. i have heard people talk very positive about it though. I think that that new flavor Eggnog Jubilee sounds delicious! If I can locate a store in our area I plan on giving that one a try! i wish we had a jamba juice near! i’ve heard so many good things about them and i’m always seeing coupons i can’t use 🙁 i didn’t know they had catering services – that’s a neat concept for a juice/smoothie operation! 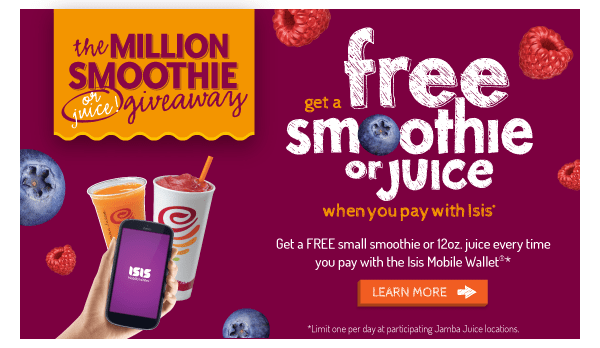 I’ve never tried Jamba Juice! There’s one nearby – this may be the time to check them out. I have no idea what jamba juice is. Is it a brand, or store? I love eggnog and want to try one or two of these.